Home Beautiful magazine recently asked for my input on a Kitchen and Bathroom feature for their upcoming September issue. It was all about space planning for ensuites and kitchens, as well as how to turn your kitchen into an entertaining zone. Here’s how it went…. HB: What should people consider when planning their ensuite? Layout. Planning in small spaces is all about layout. Think about where doors and cabinetry open and close, access and circulation. Where possible, position the toilet suite out of the line of sight. Instead, make the focal point a beautiful vanity, tiled splashback or stunning potted greenery. Consider a wet room with a single freestanding screen or nib wall in place of a shower cubicle. Storage. Floating cabinetry with generous drawers or wall mirror cabinets with plenty of shelving are good storage solutions in an ensuite. 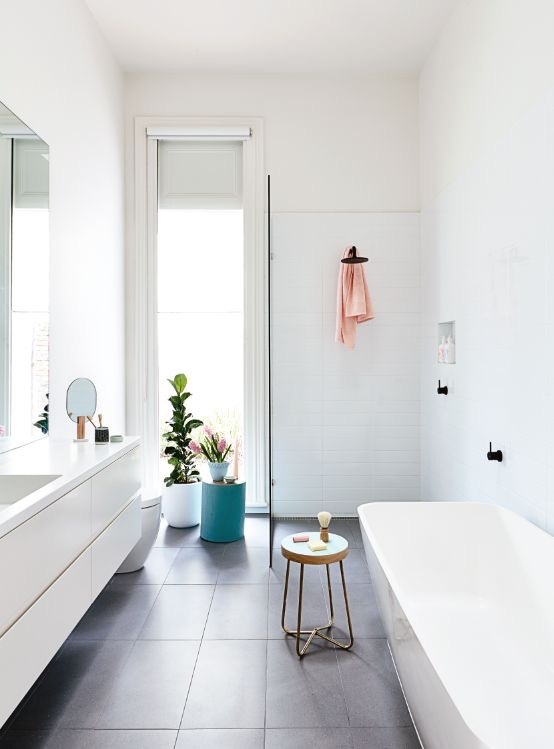 Doherty Design Studio’s Yarraville residence. Photography by Gorta Yuuki. Light. 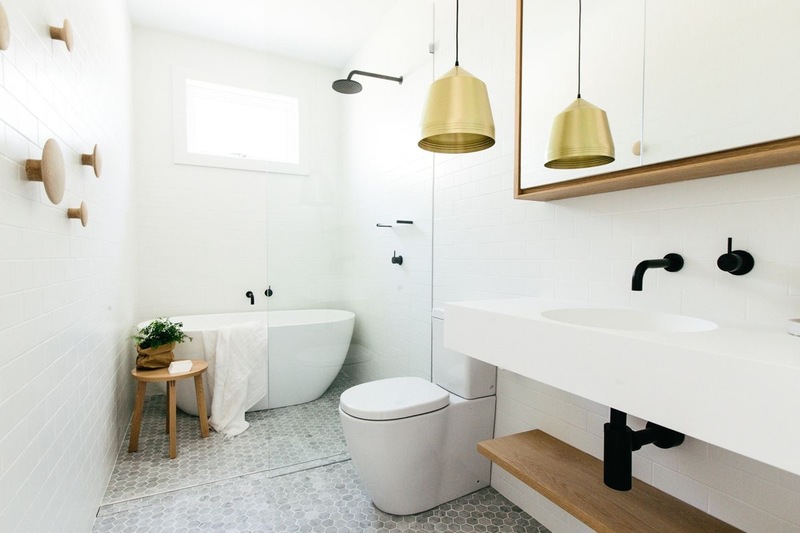 Bathrooms always look and feel better in natural light. 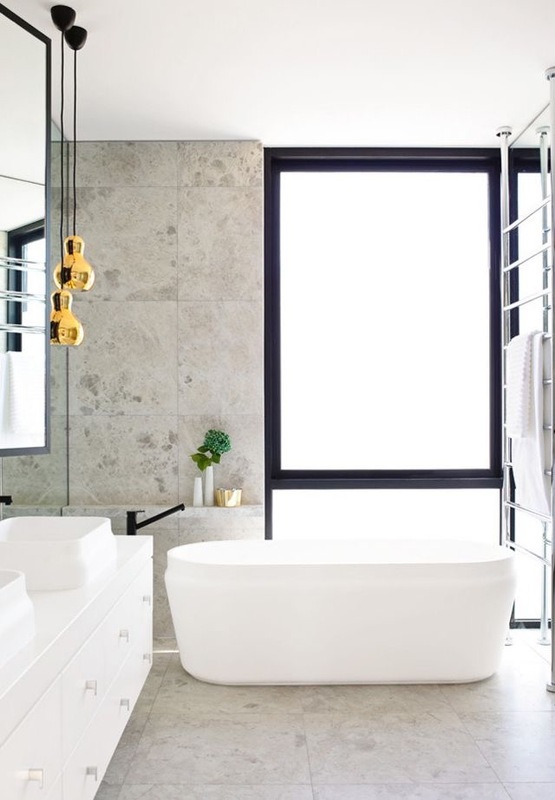 Don’t forget to include windows in your bathroom design. 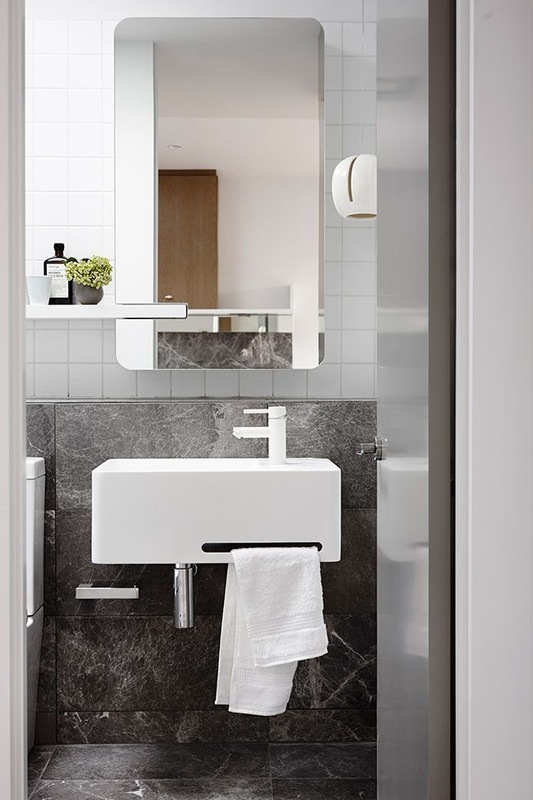 For privacy, bathroom windows are often positioned up high, but if the floorpan allows, a slim floor to ceiling window, is a beautiful solution. It lets the light in and connects your ensuite space to the outdoors. 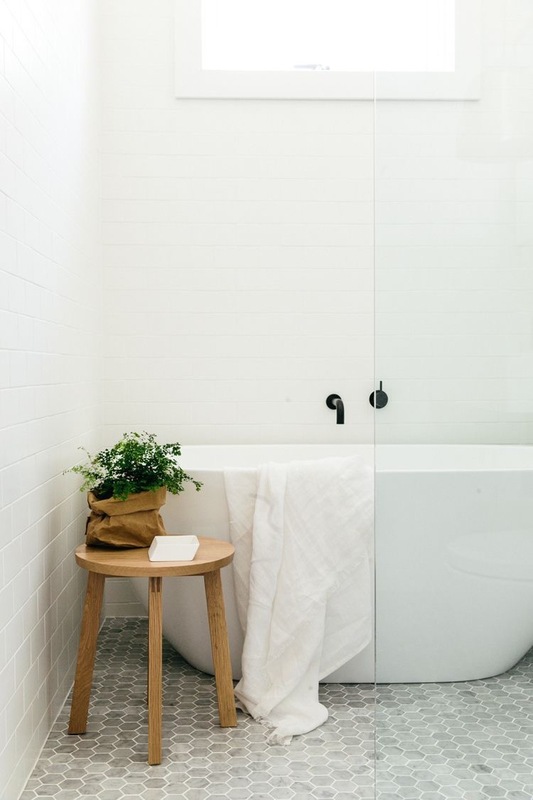 This bathroom ticks all the boxes for me – foliage as a focal point, toilet suite out of sight, seamless shower space, natural light flooding in with connection to outdoors and floating vanity. Styling by Heather Nette King. Photography Derek Swalwell. HB: What is a good starting point when choosing ensuite finishes? Choose finishes that provide warmth and texture in a small space. All-white choices can be too cold. Pair soft whites with stone and timber. Use ‘feature tiles’ sparingly and keep finishes within a palette of 2-3 tones for a harmonious feel. Bondi House by C+M Studio. Photography by Caroline McCredie. HB: What are the best material choices for bathroom floors? Pros and cons? Natural stone (marble, granite, travertine). 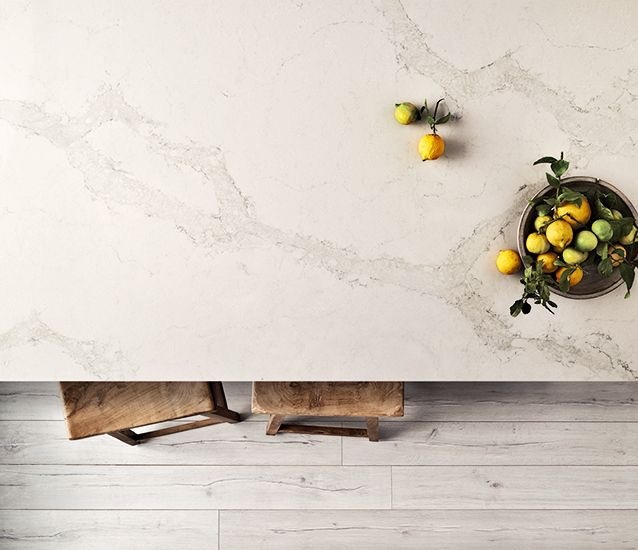 Suitable for both walls and floors, natural stones such as marble can be expensive, but are extremely durable and hardwearing. The natural patterning in marble has timeless appeal and adds elegance to a bathroom space. 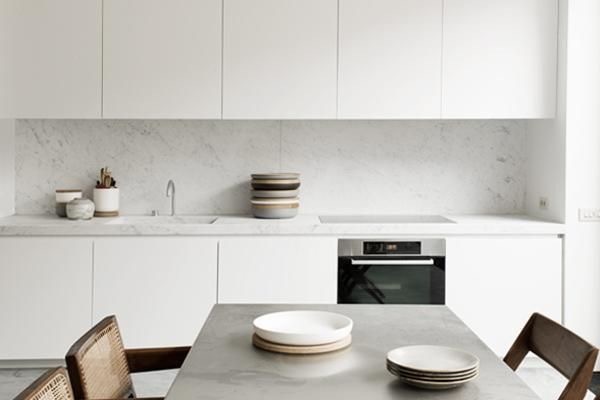 Marble floors in Crisp St Apartments by Mim Design. Cross-cut and vein-cut travertines are also popular choices for the texture and warmth they bring to bathroom flooring. 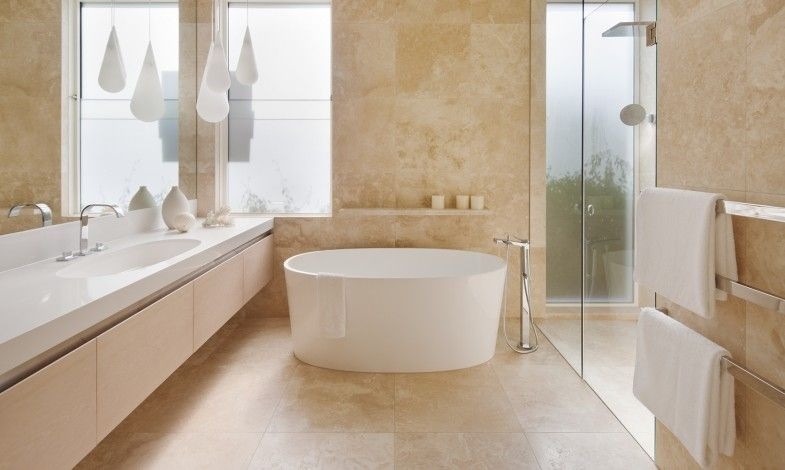 Travertine is a beautiful soft choice for bathroom flooring. These finishes do need proper sealing and maintenance. Ideal for flooring, porcelain tiles are durable, water-resistant and come in a variety of finishes from textured through to polished. Generally a more affordable option and requiring less maintenance than natural stones and marbles, I love using porcelain for the huge range of colours, textures and options available. 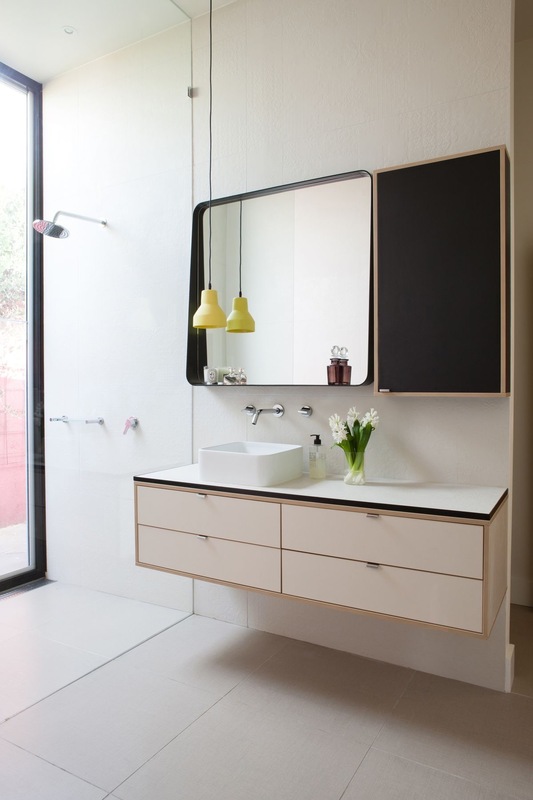 Porcelain bathroom by Mim Design. Photography by Derek Swalwell. 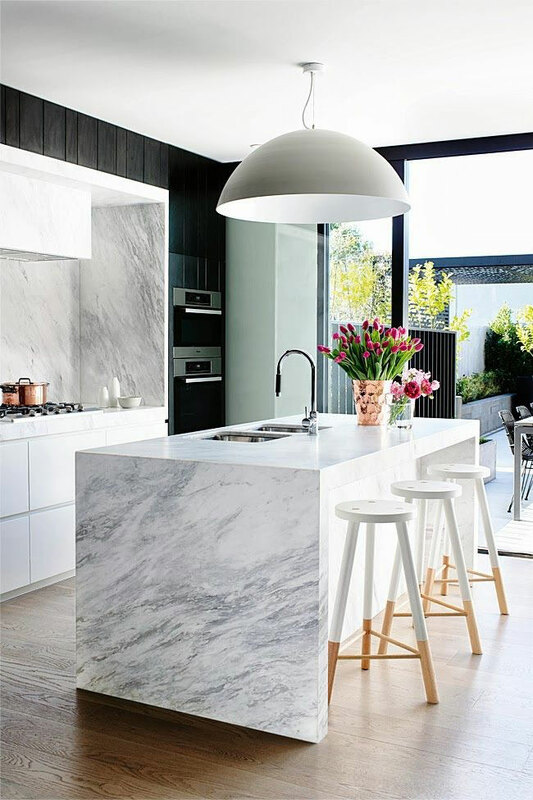 HB: What are the most popular kitchen benchtop materials? Pros and cons? 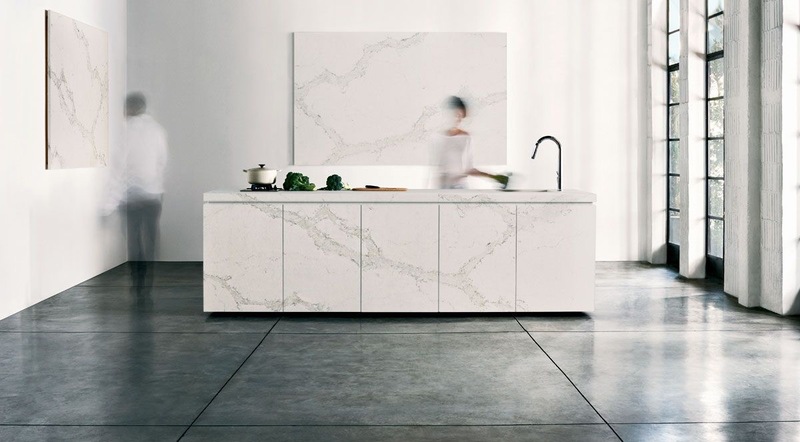 A timeless, enduring and natural material, marble has inherent texture that brings warmth and beauty to a kitchen space. It’s hard to beat the effortless sophistication of marble. However, marble is more expensive, can mark easily and requires more maintenance than other options. 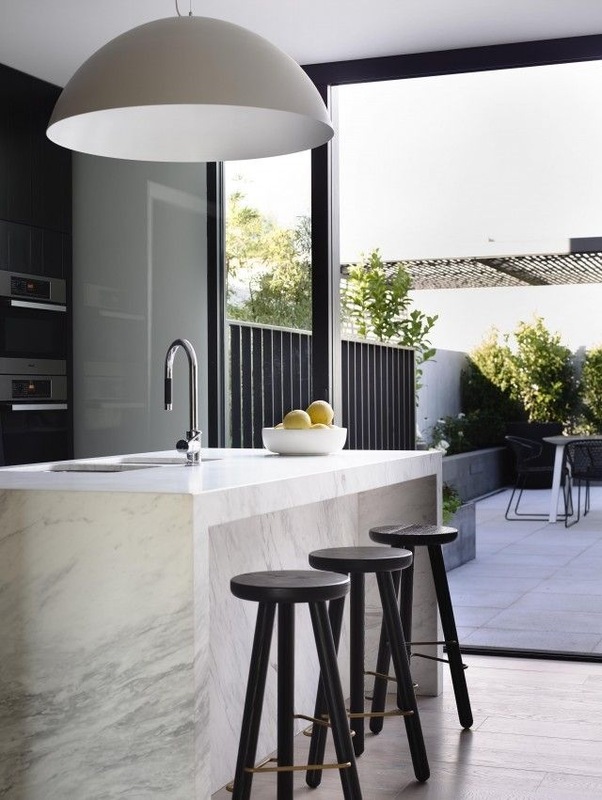 Engineered stones (such as Caesarstone, Silestone, Essastone) are a fantastic alternative to natural stones. There is a vast range of engineered stones available that emulate the look and feel of stone and marble, for less cost. Engineered stones require less maintenance and provide higher stain resistance than marble. 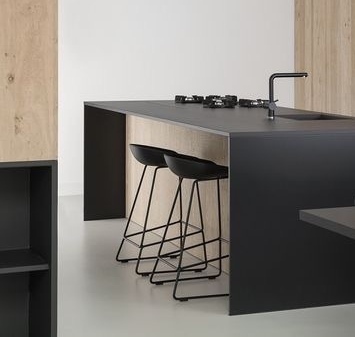 A near perfect benchtop material that is clean, hygienic and durable, stainless steel is the choice of professional kitchens where performance is important. It can, however, appear too cold in a domestic kitchen, so balance this look with other textures and finishes. Timber benchtops instantly add warmth and texture to a space, particularly in kitchen areas where hard reflective surfaces can dominate. They do need to be well-sealed and regularly maintained. 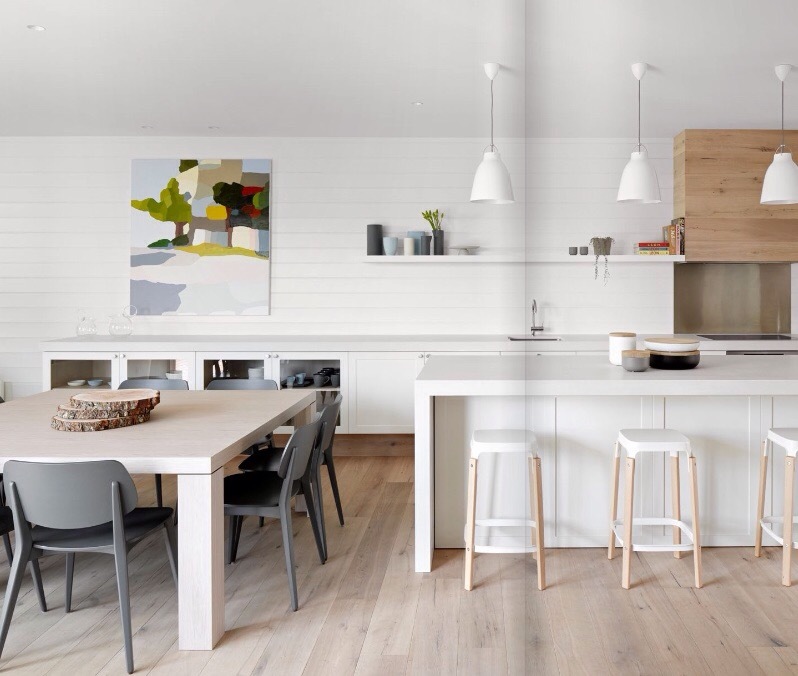 Timber benchtops in this Swedish kitchen via folk hem.se. Photography by Petra Bindel. Dining zone features the Hay ‘About a chair’ chairs and Muuto ‘Under the Bell’ pendant. Highly cost-effective and durable, laminate offers an almost limitless range of options and applications. Like the engineered stones, these ranges keep improving and delivering consumers with finishes that look and feel like the real thing. 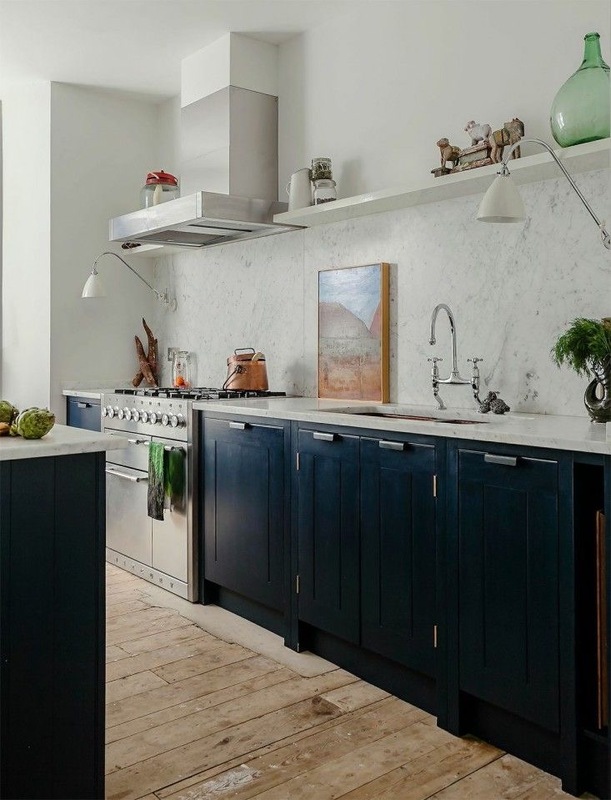 This kitchen by Fiona Lynch Design is one of my favourites for the clever use of colour and materials. Oxley residence by Fiona Lynch Design Office. Photography by Gorta Yuuki. HB: When choosing a kitchen sink what should you consider? What are the options in terms of finishes? 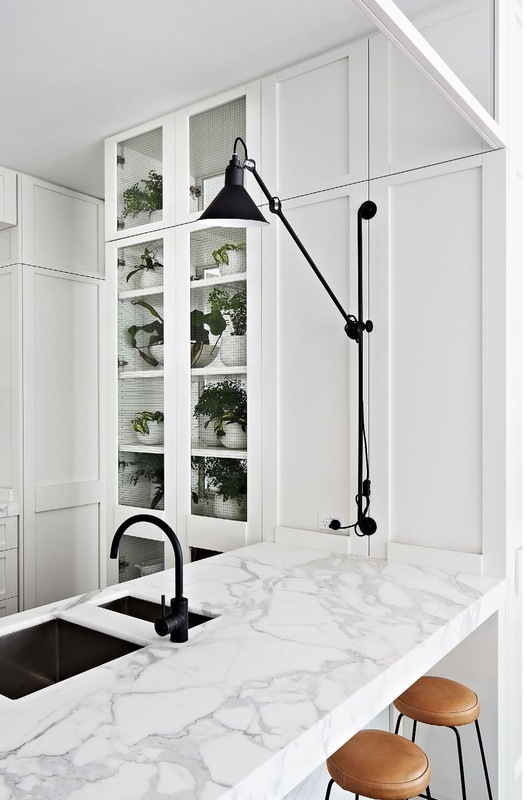 Consider whether you want your kitchen sink in the island bench, or whether it is better positioned out of the serving zone, close to the dishwasher and clearing up area. Single or double, with or without drainer. Large single sinks are popular for handling large pots and pans and, without a drainer, provide a more seamless look. Stainless steel. Affordable, durable and easy to clean, stainless steel is still the most popular choice for kitchen sinks. Undermount models are particularly easy to maintain. Brushed or satin finishes are likely to hold up better than polished or mirror finishes which will show scratches and stains. Porcelain or ceramic. Large butler sinks (or farmhouse sinks) are popular choices. They look fabulous in both traditional and contemporary settings, particularly with concrete, black and white schemes. Copper sinks are also making a comeback, and look superb paired with concrete or marble bench tops. 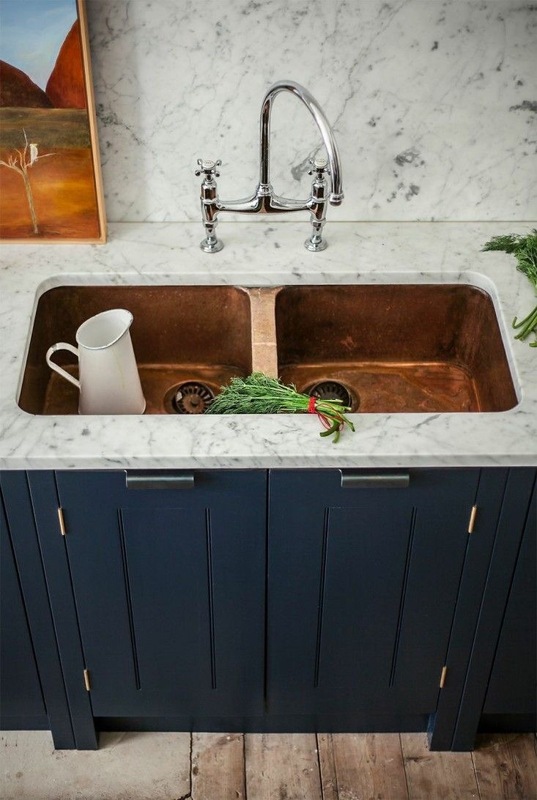 UK chef Syke Gyngell recently installed a double copper sink in her kitchen – with stunning results. A fully integrated stone sink is a beautiful (although expensive) option for a classic industrial look. 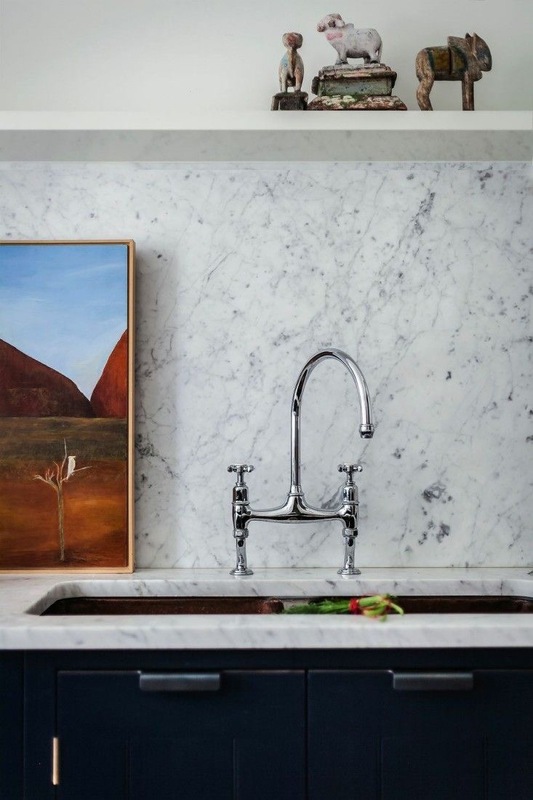 Fully integrated marble sink features in this minimalist kitchen by Belgian architect Nicolas Schuybroek. HB: What is the optimum size, width and height of a kitchen island? The optimum size of a kitchen island depends on the size and style of the kitchen. Kitchen islands should be in scale to the overall size of the room and adjacent rooms. 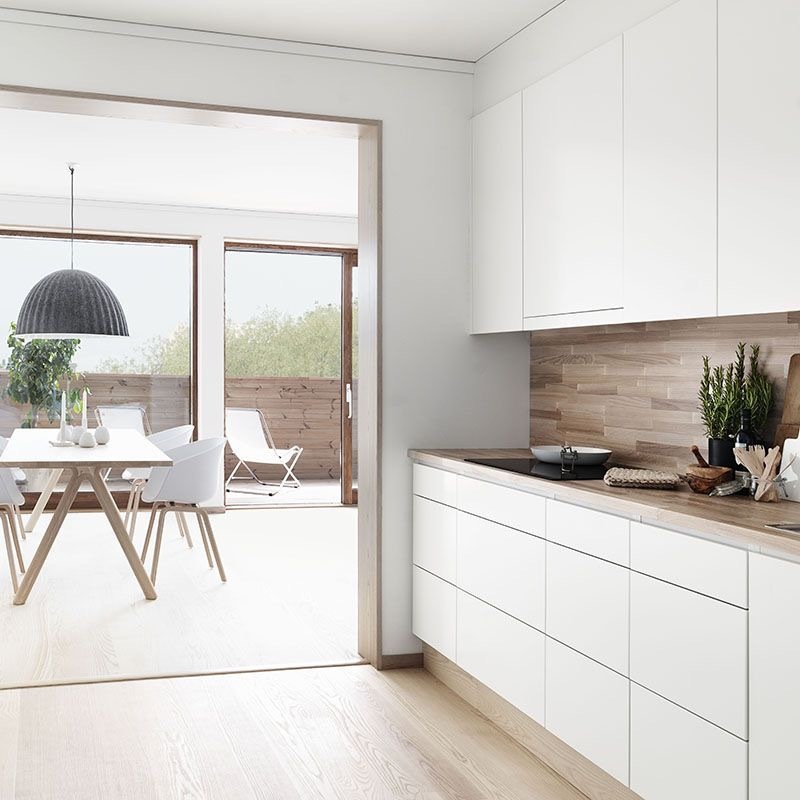 It also depends on how you want to use the space, particularly in an open plan layout. Is the kitchen island intended to be your main eating and entertaining zone? Or should it be smaller in scale to accommodate a dining space as well? Consider how your family intends to use the space and how dominant you want the island to be. 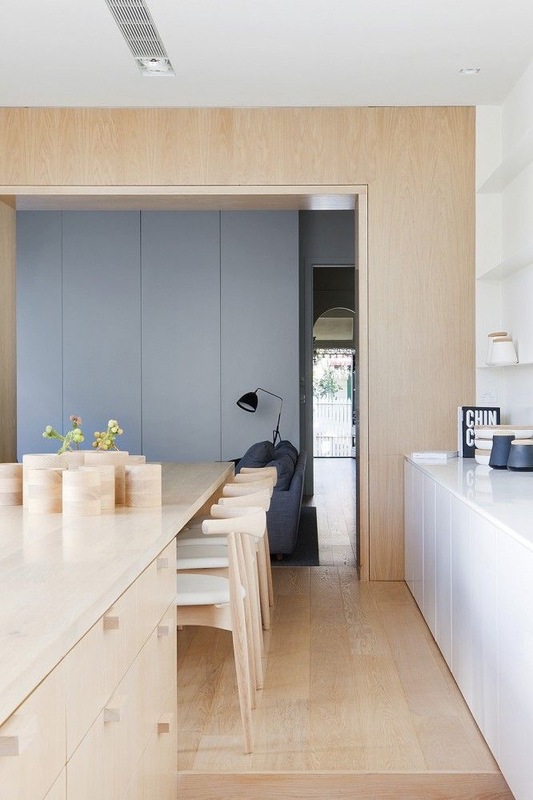 This well-planned kitchen by Mim Design allows for both island bench and dining table seating. Photography Derek Swalwell. HB: How far should it be from any wall cabinetry and how much clearance should you leave around it? The kitchen island should be positioned at least 1200mm from the opposite bench. For walkways between benches allow 1200-1500mm for people to comfortably pass, and for drawers and dishwasher to be opened. Allow about a metre on the outer side of the island for traffic flow and circulation. Standard height for kitchen island is 900mm (can vary from 800-950mm depending on height of users and personal preference). Standard depth is 600-650mm, although many go up to a metre. 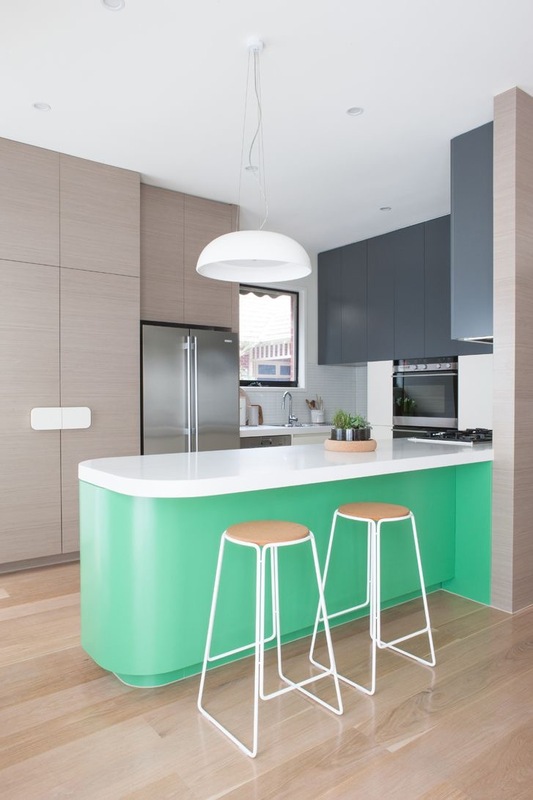 Allow at least 300mm overhang on the outer side of the island for kitchen seating/stools. HB: What are the best ways to convert your kitchen into an entertaining zone? Kitchens are increasingly an extension of our dining and entertaining areas, and take on many of the finished qualities of our living zones. Position your kitchen sink off the main kitchen island. A clear, seamless bench free of kitchen taps and dishes is a sure way to make your space feel more like an entertaining zone than a clearing and washing up area. Add a bowl of fresh blooms, light some candles and you are ready for guests. Choose kitchen stools that are light enough to move around, comfortable to sit in and encourage your guests to gather. I love the Hay ‘About a Stool’ in all black for instant style in the entertaining zone. For more on kitchen stools, see my post on Find the perfect stool. Store everyday cooking essentials such as olive oil, utensils and daily condiments out of sight. Display a few of your favourite vessels with a beautiful jug, potted plant or framed print. 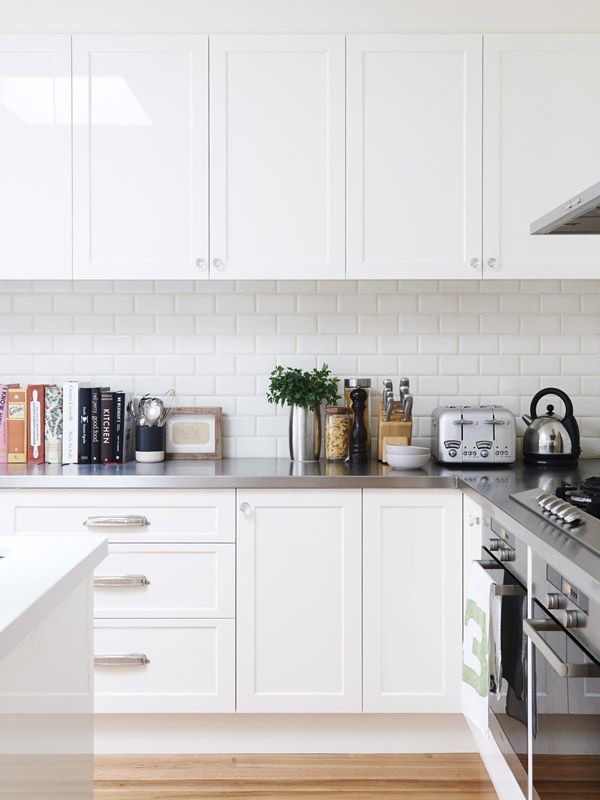 If space allows, create a ‘working nook’ in your kitchen zone devoted to keys, diary, school notices, party invitations and other bits of household clutter. Like an appliance nook, this area has a recessed door that can be closed before guests arrive. And where space is no issue, a scullery is the ultimate hide-away for kitchen mess and clutter. 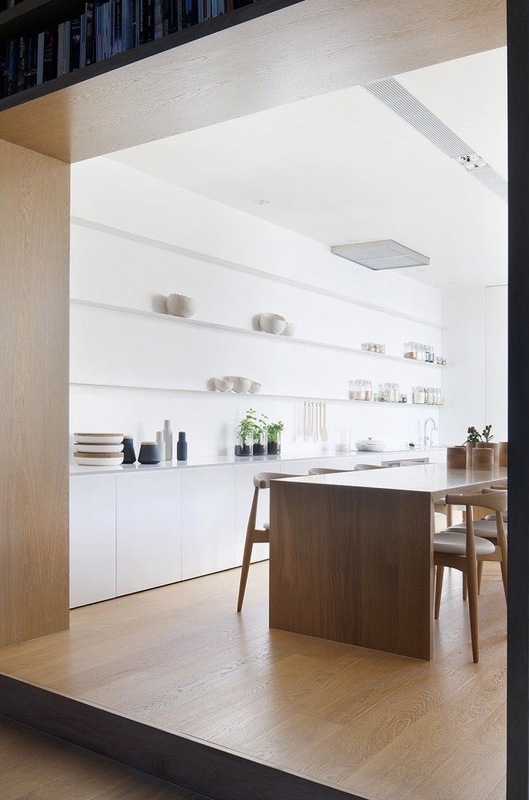 Kitchen sink is positioned off the main island and dining area in the Alfred St residence by Studio Four. Photography by Shannon McGrath. For more on kitchens, see my post on Kitchen combinations. Eloquently written as always Jane. HB is my favourite magazine for home information. 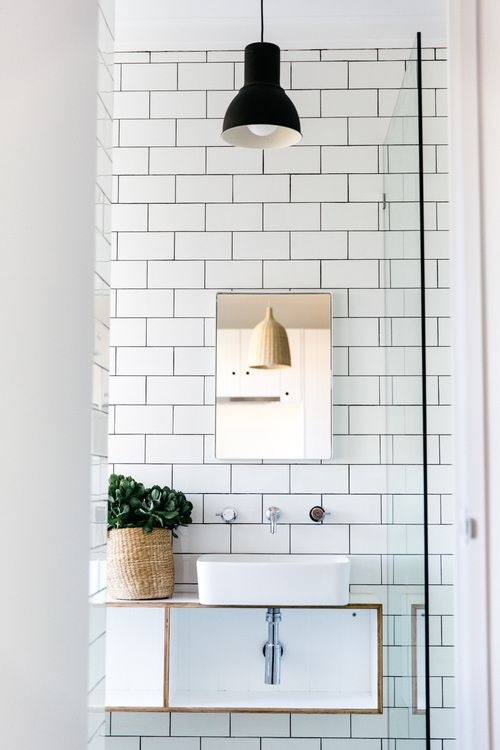 Always providing the details, realistic for Australian homes and still beautiful. I’m so happy you’ve been featured, well matched!